Acentury ago on Nov. 11, an armistice was signed to end World War I – the war to end all wars. History has shown, though, that conflict did not stop with that agreement. Through the decades, America has fought many other times in support of its ideals. Some of those wars are memorialized in the National Mall in Washington, D.C.
At a nearby location, the long-awaited World War I monument is expected to join those memorials in 2021. Whatever your opinion on war is, those who volunteered or were drafted to defend this nation should not be forgotten. Visiting the war memorials that dot the nation’s capital, attending a humble parade in any small American town or just shaking the hand of a veteran can honor their sacrifice. In the Vietnam War, one of my uncles was a marine who patrolled through thick vegetation after it was sprayed with Agent Orange. In 2014, he died from bile duct cancer, believed to be the result of his exposure to the toxic blend of herbicides as well as liver flukes. During World War II, my late grandfather served as a mechanic for P-51 Mustang fighters that battled in dogfights up in the skies above Europe. Other family members, including myself, also served honorably. On this Veterans Day, I felt I owed it to them, and to the countless others who signed up before me, to visit a few of the memorials. The first living link to the past I met was Ewing Miller at the National World War II Memorial. Just a month after he turned 95, Miller braved chilly weather to speak during a ceremony at this memorial. During the war, Miller served as a B-24 Liberator bomber pilot assigned to the 719th Squadron that flew missions out of Italy. Miller, a former U.S. Army Air Forces first lieutenant, conducted more than 20 combat missions until February 1945, when his plane was downed by a flak burst. He was the sole survivor. For the rest of the war, Miller was held as a prisoner of war. 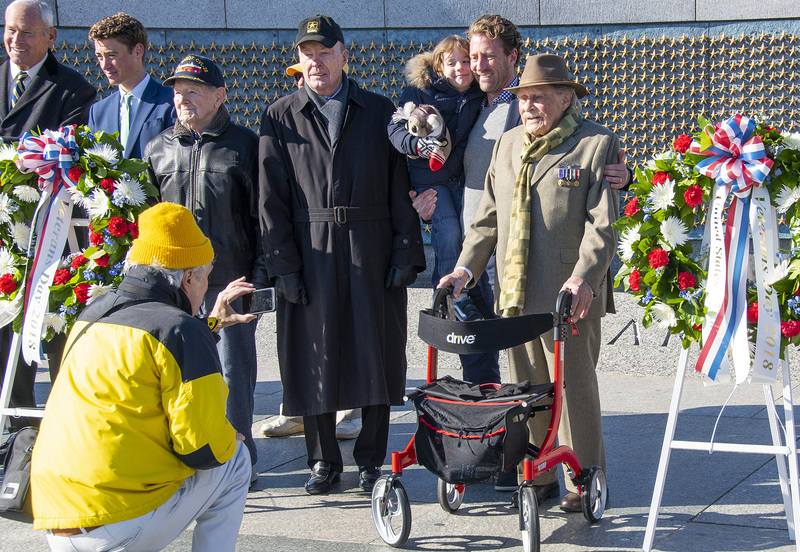 After his speech, Miller and other veterans helped lay wreaths at the memorial. With the assistance of his four-wheeled walker, Miller then posed for photos and chatted with onlookers. “A day doesn’t go by that I don’t remember those fellows,” he said to me. Adding, “But time has dulled their memory and they now have become part of that America that gave their lives from the time of the Revolution. A short walk away at the Vietnam Veterans Memorial, I traced my fingers across a few names etched into the black granite slabs that bore all U.S. troops killed in the war. The tactile sensation from the carved out names against my fingers seemed to draw me in closer. Tommy Lee Stephens … Bobby L. Weathers … Charles C. Asselta. I wondered about the lives behind those names. Where did they serve, how did they die, who still missed them? I then stepped back and watched the other visitors. In front of Panel 38 West of the stone memorial, Donald Fredenburg’s face reflected off the mirror-like polished granite. Dressed in his cavalry hat and medals pinned on his shirt, the former 1st Cavalry Division sergeant stood quietly and stared at the rows of names. Moments later, when he began to leave, I asked him why he came to the memorial on Veterans Day. “I feel that I owe it to my friends who are on this wall over here and to give them the respect that they deserve,” said Fredenburg, who lives in Atlanta. He told me he had served in Hue and lost a few buddies during his tour in 1968-1969. One, in particular, was Cpl. Donald Olsen. Both men deployed to Vietnam around the same time and were placed in the same platoon. During one mission, he and Olsen were ordered to investigate a cave possibly used by the enemy in a place called Rocket Ridge. He and Olsen were parallel to each other as they flanked each side of the cave. All of a sudden, a shot rang out. I then shook his hand and thanked him as he left the memorial. After all, he was one of the reasons I also came here.